Since version 6.0, TYPO3 CMS provides a generic categorization system. Categories can be created in the backend like any other type of record. Any table can be made categorizable and thus be attached to system categories. Since version 6.2, pages, content elements and files are categorizable by default. System categories are defined just like any other record. Each category can have a parent, making for a tree-like structure. The "items" tab shows all related records, i.e. all records that have been marked as belonging to this category. There are two ways to activate categories on a given table. The first one is to use the global setting $GLOBALS['TYPO3_CONF_VARS']['SYS']['defaultCategorizedTables']. It is a comma-separated list of tables for which categories should be activated. The default value is pages,tt_content,sys_file_metadata. It is recommended to avoid changing this setting. You should rather use the API described just below so as to avoid overriding a default which may change in future versions of TYPO3 CMS. The API is also more powerful. The second way is to call \TYPO3\CMS\Core\Utility\ExtensionManagementUtility::makeCategorizable(). This method adds a new entry into the registry managed by \TYPO3\CMS\Core\\Category\CategoryRegistry. The registry will take care of adding the relevant $TCA definition to create a field for making relations to the system categories. The call to makeCategorizable() must be located in an extension's Configuration/TCA/Overrides folder (or ext_tables.php file before TYPO3 CMS 6.2.1). The above code will add a categories field to the "pages" table, which will be called tx_examples_cats. The fieldConfiguration part of the options array is the one which overrides the base $TCA structure. In this case we would like categories to be listed alphabetically instead of using the "sorting" field. If no label part is set in the options array, the field will be labeled "Categories". By default, the field will be an exclude-field. The exclude part can be used to override this. 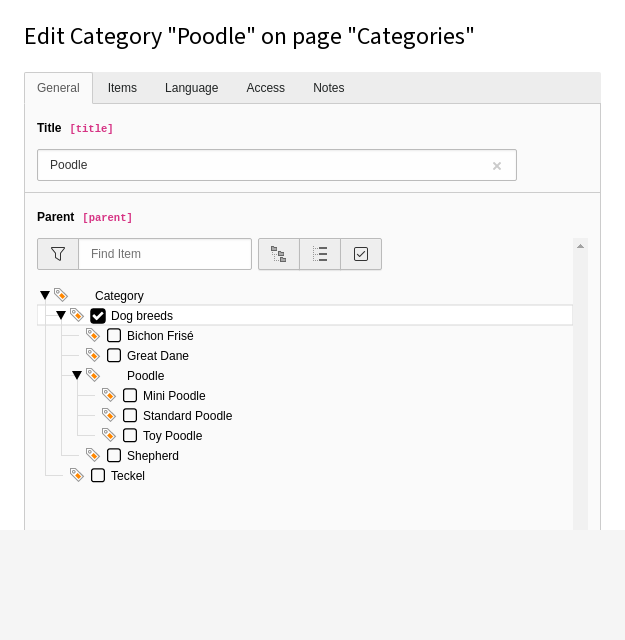 It is possible to create relations to categories also in Flexforms, although this has to be done manually since no API exists for this. Properties tablenames and fieldname would need to be adjusted. 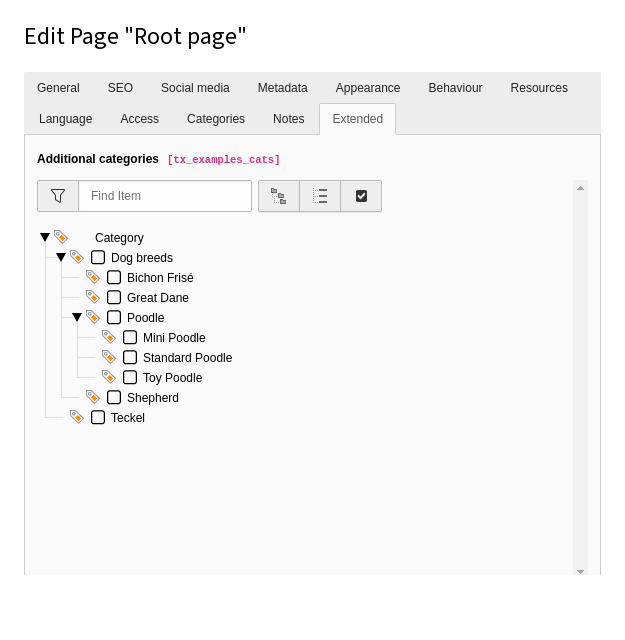 Beyond makeCategorizable(), class \TYPO3\CMS\Core\Category\CategoryRegistry has many other methods related to the management of categorized table. The best way to discover is to follow the link above and explore the methods provided by this class. They are all quite specialized and should not be needed most of the time. The \TYPO3\CMS\Core\Category\Collection\CategoryCollection class provides the API for retrieving records related to a given category. Since TYPO3 CMS 6.2, it is extended by class \TYPO3\CMS\Frontend\Category\Collection\CategoryCollection which does the same job but in the frontend, i.e. respecting all enable fields and performing version and language overlays. As all collection classes in the TYPO3 CMS Core implement the Iterator interface, it is also possible to use expected methods like next(), rewind(), etc. Note that methods such as add() will only add items to the collection temporarily. The relations are not persisted in the database. In the frontend, it is possible to get collections of categorized records loaded into a RECORDS content object for rendering. Check out the categories property. The HMENU object also has a "categories" special type, to display a menu based on categorized pages.